The Pacific Maritime Association, an organization of port terminal operators, ocean carriers, logistic firms that handles labor relations and contract negotiations for its collective members, recently issued its annual report, saying that West Coast ports are at last prepared to move towards greater automation – but from our view there is still a long way to go. Losing a port job can be quite a blow to union workers. The report says that in 2011, the average pay for a longshoreman was $129,392; the pay for foremen was $198,260. It has been a tough few years for once high-flying West Coast ports, starting with major congestion issues in LA/Long Beach in 2005 and 2006 that caused many shippers to move more containers to not only other West Coast ports but also alternative locations such as Houston. The recession saw a steep decline in container volumes, as global trade was hit even harder than the general economy. The report, however, says that in 2011, total traffic finally returned to just under 2008 levels, though still well below the peak reached in 2007. In 2011, about 15 million loaded TEU were handled at West Coast ports. That was up just 1.5% while total revenue tonnage also notched up a modest 2.4% over 2010. The report is optimistic about the future of West Coast ports despite concern in some quarters that when the expanded Panama Canal opens near the end of 2014, it will drain off a significant number of containers that would once move through the West Coast. A key strategy, the report says, is for the ports to invest now in automation that will speed handing of the containers, and to create more capacity before a crunch really hits down the road. “West Coast terminal operators are preparing to automate on a scale not yet seen in the United States,” the report says, a move driven by not only the threat from the Canal expansion but the growing dominance of megaships, which will take extra long to unload if the status quo is maintained. To make these improvements, however, requires cooperation and contractual permission from the Longshoremen’s union (IWLU). The report says that the union has recognized the right of terminal operators to automate cargo-handling equipment, while the PMA in return has provided assurances that maintenance and repair work on automated cargo-handling equipment be handled by the ILWU. The report says that PMA members are committed to training the ILWU workforce in the maintenance and repair of future and forthcoming automated equipment as an offset to the loss of some traditional longshore jobs resulting from the automation. Losing a port job can be quite a blow to union workers. 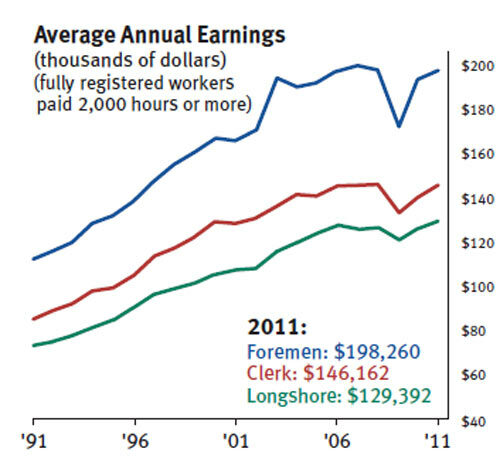 The report says that in 2011, the average pay for a longshoreman was $129,392; the pay for foremen was $198,260. (See graphic below). But the plans are in the early stages: the report says that projects “on the drawing boards” include plans for terminals with automated quay cranes outfitted with optical character recognition technology. The cranes will have a reach spanning 24 containers side-by-side to handle the ship-to-shore transfer. Automated Guided Vehicles (AGVs) will serve as the interface between the vessel and the storage yard. Storage yards will feature electric semi-automatic gantry cranes and/or automatic stacking cranes (ASCs) with remote control container loading to on-dock rail cars or onto truck chassis. But even with the acquiescence of the IWLU, the process to get all the approvals required can still be a lengthy process. Next week, we will highlight some of the specific improvement projects either completed or in some stage of developments at West Coast ports. Do you think we will really see more automation soon at West Coast ports? How important is it that they start to more automate soon? Let us know your thoughts at the Feedback section below. Automation is coming. There is no doubt about it. Every terminal will eventually have some sort of automation. The article should also state that some terminals in Asia have gone back to using manpower as automation is too slow for the amount of work they have. The West Coast Ports handle upwards of 35% of all cargo coming into the USA. No other terminal handles that much cargo destined for one country. Automation on the West Coast will slow production down. One terminal in LA (TRA PAC) tried to install an automatic cone release system. This system would take the cones off each container. This system slowed production down from 32 moves per hour to 24 moves per hour. So if companies want to get rid of the ILWU for slower production and turn around time just to save a buck, then let them do it. They will be the ones to suffer in the end. I think that the other countries that are listed in the article that are already automated are tiny compared to the West coast and the work load that they have is small as well. Plus they probably don’t have enough longshoremen or union members to handle the work load. On the other hand, the Pacific Maritime Association has repeatedly reneged on promises to elevate casuals to full-time status. I think the union in LA/Long Beach should go for broke and really show the PMA what the waterfront union is all about because they cry about economy and all the expenses unions cost but in reality if they would only stick to the contract we both signed we both would be smooth sailing. So I say no to theBS automation and all the other Chinese steel craftsmanship that our government allows into US ports. Cheap labor and cheap products. And say it is time for the union to take back what is ours. No scabs in my union. We believe most of the ports cited as proving the value of automation are in fact very large ports. The salary information written in this article is complete fantasy [average $129,000 or so]. I have been working in the port of SF/Oak for 7 years and have yet to pass the $90,000 mark. That is working 6 days a week. They are taking a few crane drivers that are on steady call backs and using this for the average salary. Maybe do a bit more research and due diligence before you publish. As a reporter you should be ashamed for allowing a company to give you such false information without fact checking it. We are simply published the data from the Pacific Maritime Association's annual report, which manages payroll for most of the West coast port and terminals, which had the air of legitimacy to us. Automation relying on computers will undoubtedly be accompanied by the added worry of hacking by foreign competitors and/or malicious anti capitalists types. That along with the perpetual and ever present affects of corrosive marine air on electronics, should create breakdowns and delays. I would be surprised if automated ports like Rotterdam are telling the whole truth. I suspect that by the time the automation pays for itself, it will be time to replace the entire corroded sytem.